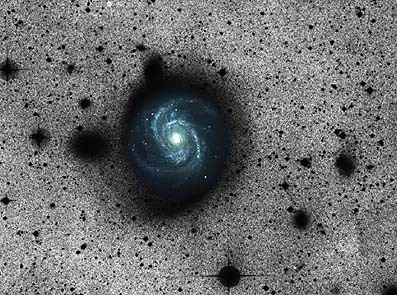 David Malin's deep image of M100 reveals that this spiral galaxy is actually a giant which reaches far out to interact with its faint neighboring galaxies. While this interaction, on the one hand, is probably responsible for the pronounced spiral structure of this galaxy, it also disturbes the contours of M100's outskirts. 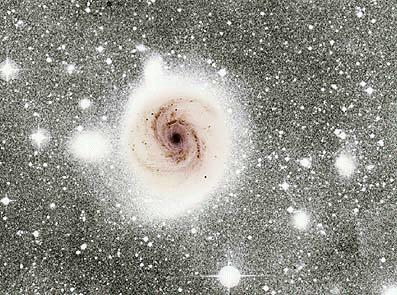 As in other deep images of galaxies, it is suggested that significant portions of the galaxy's mass may lie in the faint outer regions which cannot be traced in conventional photographs. Above images are copyrighted and may be used for private purpose only. For any other kind of use, including internet mirroring and storing on CD-ROM, please contact the Photo Permissions Department (photo at aaoepp.aao.gov.au) of the Anglo Australian Observatory. For technical info on deep astrophotography, look at David Malin's webpage on special photographic techniques.